I made very easy salad with tofu and some greens. 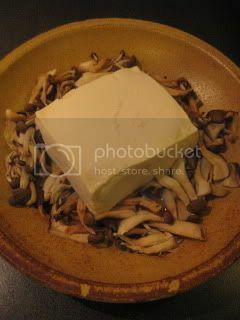 Just set the mixed mushrooms and a piece of tofu, with a splash of 2T of sake, in a microwavable donabe steam-roaster, "Tochinsai" (without a grate). Cover and cook for 4.5 minutes (700-watt). This microwavable donabe is really amazing. You wouldn't believe it's cooked in microwave. Tofu comes out so fluffy and mushrooms are perfectly aromatic. Meanwhile, to make the "namul" style dressing, combine 1T sesame seeds (roasted and ground), 1 small clove garlic (grated), a pinch of brown sugar, a pinch of salt, 1/8 tsp soy sauce, 1t olive oil, 1T sesame oil, and a pinch of thinly-sliced dry red chili. 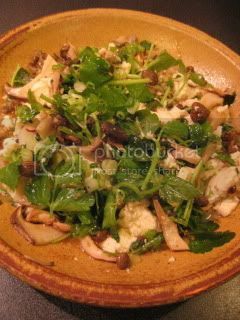 To finish, pour the dressing over the tofu & mushrooms, and mix by a large spoon by breaking the tofu. Add some minari (dropwort - you can substitute with watercress or other green of your choice) leaves and toss again. That's it. You cook, mix, and serve in just one Tochinsai. So easy. And, it's so tasty.